Some of the most salient notions to be promoted in relation to mashrabiyyahs are their timelessness, universality and versatility. That means that mashrabiyyahs were central to the total purpose and function of houses as family development centers and institutions, and thus, should be honored and promoted only as such. The mashrabiyyah phenomenon ought not to be particularized, regionalized, or rendered just ornamental or auxiliary. Some of the perennial mashrabiyyah-related misconceptions, such as those that mashrabiyyahs screened and protected inaccessible and vulnerable women only, rather than the inviolability and integrity of the whole family as well as the house institution; that they “trapped” and concealed helpless women behind the house walls so she could “look out without being seen”; that they were at once the emblems and “guardians” of harems behind whose walls unrelenting exciting, exotic and hedonistic events, experiences and even intrigues were taking place – must be resolutely and conclusively repudiated. Further, the way mashrabiyyahs were perceived, fashioned and whittled was neither a prescription, nor an accident or a contingency. It rather demonstrated how the growth of Islamic architecture was scrupulously conscious of, and responsive to, the terms and corollaries of the aspects of Islamic cultural and civilizational maturation which Islamic architecture was meant to exemplify, disseminate and facilitate. Thus, the cultural and civilizational individuality, as well as the historical genesis and ultimate fruition, of mashrabiyyahs need to be duly respected. However, one of the optimum expressions of such respect will be to allow the phenomenon of mashrabiyyahs to continue to flourish in contemporary times. Just as considering them to be either a stipulated or merely accidental architectural component, or saturating them with literal symbolism and conceptual as well as functional misconceptions and fallacies, would be grossly inappropriate and just plain wrong, terminating or fully restraining the natural evolution and adaptation of mashrabiyyahs in our modern times would likewise be as erroneous and even tantamount to a crime against Islamic architecture. For mashrabiyyahs to be really desired and rendered functional today, cultural, intellectual and even spiritual conditions, which will call for their actual subsistence and operation, need to be spawned first. In other words, for supplying genuine mashrabiyyahs, a genuine demand must be generated first. Refined cultural, intellectual and spiritual concerns are to be foremost dealt with in that process, because it is those concerns that start off and expedite a civilizational march, whose visual shape is nothing else but architecture. Architecture, therefore, is to be seen as serving society and people, and architects are no more than servants of their society’s vision, mission and purpose. The intellectual culture and the total educational proclivity of both the Islamic built environment professionals and the general public are thus to be continuously re-examined and upgraded, so as to make sure that all aspects of Islamic civilizational awakening are integrated and harmonized, and that all the protagonists in the system pull towards the same direction. It follows that mashrabiyyahs, just like the rest of the Islamic architectural orb and vocabulary, ought to become again a part of Islamic urban culture, and a part of the physical language of the Islamic city as a living organism, and of the community building processes. They will need to occupy a prominent place in what could be dubbed the sociology of Islamic architecture, in the sense that mashrabiyyahs will represent in their own way a close interaction between Islamic architecture and the populace, and how specific architectural expressions and styles are illustrative of certain perceptions, ideas and inclusive behavioral patterns. In addition, mashrabiyyahs will need to perform as architectural elements native, not alien, to their places. They will need to be fully aware of their physical and metaphysical contexts, taking from them and further enriching them, and will not exist as separate and autonomous entities, but as parts of the whole. They will also need to be socially produced, that is, to be a complex social construction based on people’s values, traditions and beliefs, which, in turn, will affect subsequent spatial perceptions and practices. Mashrabiyyahs should not be a victim of a syndrome of “tearing space away from place” which is most commonly associated with the modernity paradigm to whose onslaught the Muslim world, especially, has been subjected. They should enrich the lives and emotions of the people who use them, engaging by means of their inspired designs, functionality and limited symbolism in a dialogue with the history, beliefs, attitudes and needs of a particular place and time. In short, contemporary mashrabiyyahs will need to be a Muslim product and solution alone. They will need to relate to their socio-cultural, environmental and ideological contexts, making a critical, unprejudiced and rational, rather than sentimental or copyist, response when dealing with the tradition-versus-modernity predicament. Bona fide contemporary mashrabiyyahs will never become a reality should Muslim architects and designers resort to the excessive veneration and blind following of certain either Muslim or non-Muslim architectural traditions and norms. Excessively glorifying and blindly following and imitating a style will never be a solution. Such actions were always counterproductive, standing for the antithesis of architectural dynamism, productivity, originality and vision. Owing to the universal character of most of the values mashrabiyyahs embody, when revived and properly put into operation, mashrabiyyahs can be useful to non-Muslims as well, in particular if they shared the same environmental conditions, as well as certain social and cultural norms, with Muslims. However, if that happened, the practice will not be atypical, for, historically, it was natural for non-Muslims in many Muslim regions to employ some types of mashrabiyyahs in their houses. 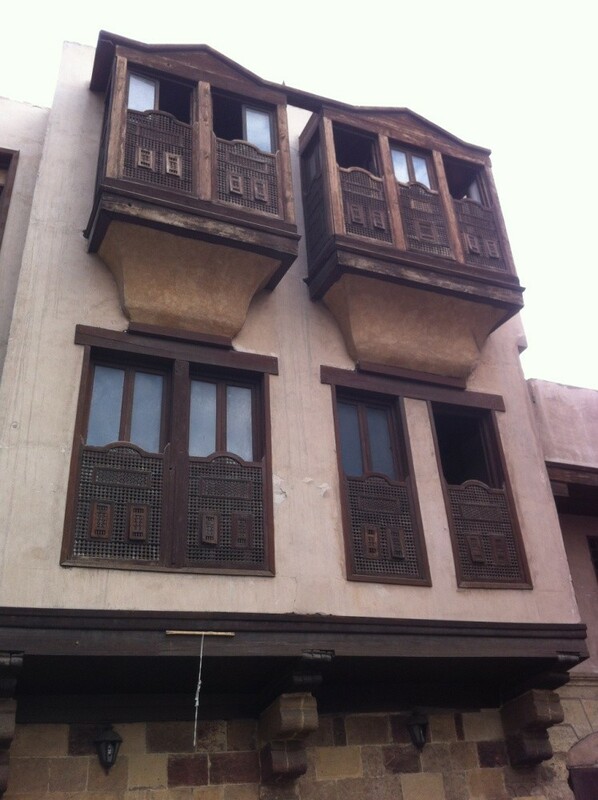 One of such examples is Egypt where the domestic architecture of Coptic Christians often featured lattice screens. Several examples of such screens that incorporated Coptic crosses, for example, as symbols and decorative media are still preserved intact in the Gayer-Anderson Museum in Cairo, next to the Mosque of Ahmad b. Tulun. A contemporary style of mashrabiyyahs will have to be fashioned and applied as part of inclusive and organic architectural processes. By no means should it correspond to context-less, alienated, precast and imposed end products from which both the Muslim architectural consciousness and palpable reality will have to suffer ad infinitum. However, in order for a contemporary mashrabiyyahs style to increase the odds of its success and wide acceptance, it will need to portend a segment of an all-embracing renaissance of authentic contemporary Islamic architecture. At the heart of such an architectural renaissance the following conceptual and practical aspects will have to feature most prominently: redefining some of the basic concepts in Islamic architecture which have become fraught with misconceptions and errors; revisiting and rethinking at once the substance and delivery methods in Muslim architectural education; overhauling and fundamentally improving Muslim architectural research and publication culture; restoring confidence in the minds and hearts of Muslim designers and architects by affirming the architectural profession as a life mission and a form of service to people, society and Islam as a civilization and a way of life; initiating and sustaining at all levels of the Muslim architectural and civilizational presence a culture of comprehensive professional, intellectual and spiritual integrity and excellence; active and productive public participation in architecture with most appropriate techniques and levels of participation. Contemporary mashrabiyyahs will have to be conceived and imparted as contemporary solutions to some of the perpetual problems and dilemmas confronting the built environment of Muslims. Similarly, they will represent the ways the Muslim artistic and architectural vision and resourcefulness, prompted and guided by some of the underlying teachings and values of Islam, acted in time and space trying to provide answers to those problems and dilemmas. Mashrabiyyahs, it goes without saying, ever since their commencement connoted the results of the interplays between the enduring and the transient, the universal and the indigenous, and between the physics and metaphysics, and will have to continue as such. Thus, mashrabiyyahs will have to function, first and foremost, as screens, regardless of their sizes, designs and locations, facilitating the preservation of privacy at various points of buildings and with mixed degrees of sensitivity, especially in private houses. They can be made of timber, steel, concrete and even aluminum. They can be types of oriel windows, perforated or latticed screens (like jalis in India), or just windows using shutters, Venetian blinds or brise-soleil (sun-breaker) as coverings. Next, mashrabiyyahs should function, partly or fully, as aptly screened balconies, terraces and loggias so as to add outdoor living spaces to dwellings. This should be especially so in housing units and residences where balconies, terraces and loggias are either one of a few outdoor spaces, or the only outdoor space to which residents might have access, above all in high-rise apartment buildings built in compactly populated areas. In this case, all the considerations relating to privacy protection, neither causing nor reciprocating harm, peaceful coexistence with the environment, enhancing the aesthetics and overall functionality of houses, physical, emotional and spiritual communication and interaction with the outer space, will need to be duly considered. On that note — in passing — today the residential architecture of Muslims in most geographic regions abandoned, partly or completely, its traditional Islamic identity and soul in favor of some alien and hence, inappropriate alternatives. As a matter of fact, such alternatives were never people’s happy choices. They were aggressively promoted and unilaterally imposed as part of the intense intellectual, cultural and spiritual onslaughts and deceit of colonization, globalization, progress and modernity. Consequently, the Muslim architectural consciousness and class receded and greatly suffered. Muslim houses were less and less functioning as critical societal institutions and family development centers, showing more and more deficiencies in embodying, facilitating and promulgating the integrated individual and societal message of Islam. Indeed, a myriad of those residential problems and quandaries came to the fore as regards the ways many modern Muslim houses dealt with the prospect of regulating and guarding their windows, balconies and main entrances. Unfortunately, they were debilitated and impaired to offer much substance thereby, failing in the process to satiate the authentic Muslim artistic and architectural thirst. Thus, one can often find that some crude, unaesthetic and disproportionate means and methods, such as random curtains, blankets, panels, boards, planks, rough and sometimes even unfinished protective walls and parapets, etc., were desperately resorted to in order to provide some ad interim solutions. So desperate were the conditions that seldom anybody really cared about those devises’ and methods’ actual beauty or their potential spiritual profundity. A colleague in IIUM (International Islamic University Malaysia) from Iraq who recently rented an apartment unit in Kuala Lumpur once lamented that his wife hardly ever took off her scarf while performing her routine household chores inside. He said that such was the case because the balconies, numerous windows, main entrance and even the kitchen were planned, designed and “protected” in such a way as to make the whole family, but especially his wife, always feel inconvenient and somewhat “exposed”. 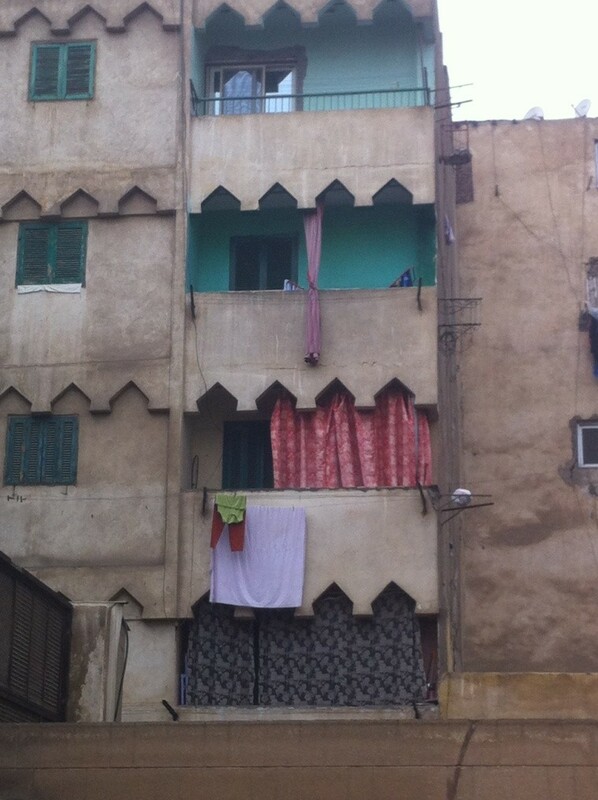 Crudely screened balconies in Cairo. 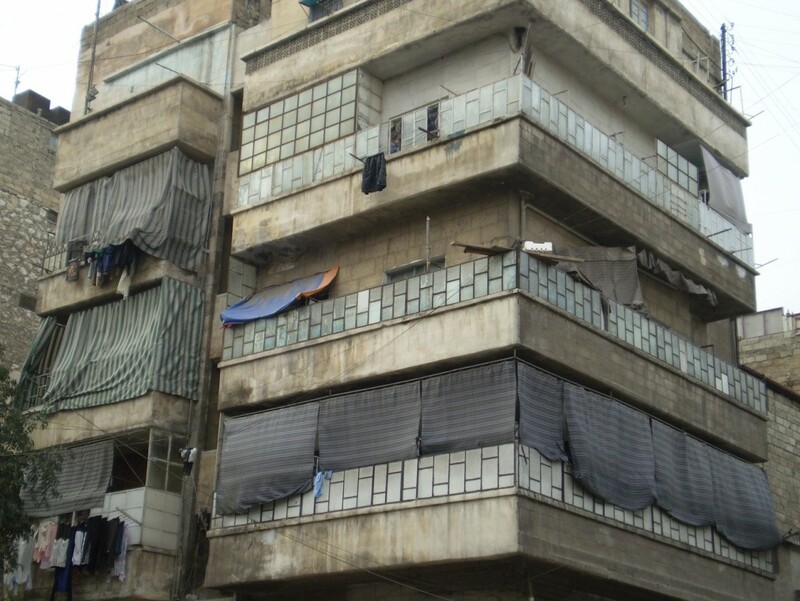 Crudely screened balconies in Aleppo, Syria. What is more, the eternal intrinsic environmental advantages of mashrabiyyahs in terms of light intensity manipulation and air ventilation are never to be underestimated. An endless range of mashrabiyyahs’ lattice screens and coverings with or without openable windows, glazed or unglazed, that provide shade and protection from the sun, while allowing the fresh air from the outside to flow through, signifies environmentally sustainable built environment capacities about which Muslim designers and architects should be extremely excited, exploring them to the fullest extent possible. Indeed, it is high time that the depressing environmental states of human societies and their built environments bring home to people how desirable and urgent making serious and lasting contributions to sustainable development at all levels is. Muslims, in particular those living in hot-arid, hot-humid and Mediterranean climatic zones, thus need to come to terms with the truth that depending excessively on artificial light for lighting and air conditioning for cooling is not the best option for health. Some of the most common issues cited with respect to the former are exposure to invisible radiation and worsening certain medical, especially skin, conditions, and with respect to the later are causing certain illnesses and constant fatigue, causing dry skin, adding to the effects of some chronic illnesses, the inability to deal with heat, and breathing problems. The magnitude and diversity of the climatic potentials of mashrabiyyahs are thus to be ingeniously taken advantage of and applied as much, and as imaginatively, as possible, while fully complying with the dictates of respective native socio-cultural, economic and environmental factors and features. Finally, mashrabiyyahs could be applied as buildings’ ornaments. However, this by no means suggests that mashrabiyyahs can be planted on the facades of buildings indiscriminately and pointlessly, in contempt of their overall designs, forms and functions. Rather, their being buildings’ ornaments means that their existence and function ought to be subservient to the total decorative as well as functional paradigms of buildings they adorn. They ought to be part of a bigger deeply meaningful artistic and architectural picture, supporting it and playing second fiddle to it. This is so because in Islamic art and architecture, generally, the principle of “art for art’s sake” does not apply. No artistic or architectural element is to be divested of serviceable meaning and purpose. *This article is an excerpt from the author’s forthcoming book entitled “Appreciating the Architecture of Shamiyyah”. Writing the book is fully sponsored by Omraniyoun, a leading Saudi architectural design company based in Makkah (www.omraniyoun.com). 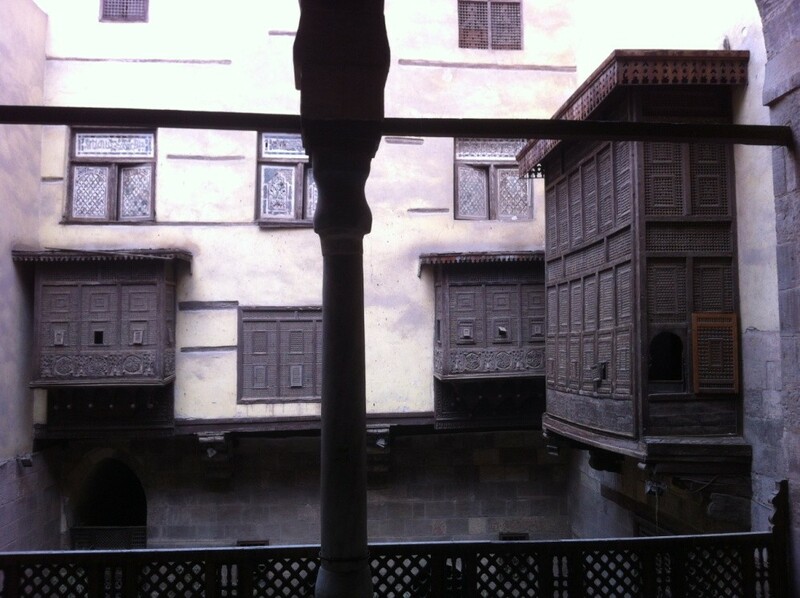 Rawashin and mashrabiyyahs signify projecting windows that are enclosed with carved wood latticework.